When you think about painting your home, you might want to consider hiring a professional painting contractor in your area. As we covered previously house painting is a very labor-intensive process that really does take a big commitment to do the right way. If you think you are going to spend your weekend painting your house and it’s going to be an easy job, you are probably going to end up quite disappointed. More than a few people have tried to paint their home themselves only to find out that it was a much bigger job than they anticipated. And if you’re not careful, you could end up on your HOA’s bad side. Your HOA might be a pain to deal with sometimes, but for the most part, they are on your side and will protect your property value by keeping your neighborhood in great condition. With that being said, if you try to paint your home yourself and your HOA is not pleased with the results, then you are going to have a problem. They will probably start by sending you a notice that your house no longer complies with the acceptable appearance standards that they require. Then they will require you to correct your home and have it painted so that it meets those standards. If you don’t comply with those requests then you are going to end up looking at ever escalating fines and the unending aggravation of having to deal with the issue on a regular basis. If you don’t want to have to deal with an unhappy HOA when you have your house painted, then hiring a painting contractor is definitely your best option. A professional painting contractor will do a job that should easily meet any standards that an HOA has. If for any reason they don’t meet those standards then you can always contact them and ask them to fix the problem. 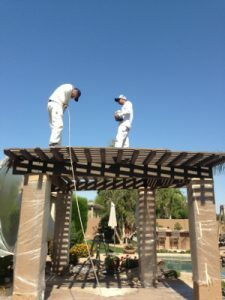 As a professional business most painting contractors will go out of their way to make sure you are happy since their reputation is important to the future success of their business. It costs money to hire a house painting contractor, so how is it possible that hiring one will save you money? First of all, if you decide to paint your house yourself, and you don’t do a great job, then you are going to have to hire a house painter to come out and fix your mistake.